Shut down a malfunctioning Dwarven weather machine. Enter Runoff Caverns and navigate your way to the entrance to Vardnknd. 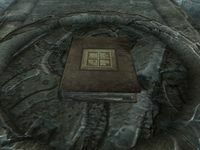 Read Elberon's Journal in Vardnknd Gallery. Enter Autumn's Bells and place enough wheat in the depositories to access the Conduit Control Gem. Enter Spring's Symphony and kill the Blooming Spriggans to open your path to the Conduit Control Gem. Enter Summer's Chords and use the Spider Control Rod to direct a Repair Spider to every service waypoint. Enter Winter's Chimes to locate and retrieve the Conduit Control Gem. Once all four Conduits have been deactivated, return to Vardnknd Gallery to fight off the remaining mercenaries and open the way to Vardnknd Skykiller Gallery. Defeat the Sky Orchestrator and claim Turn of the Seasons to gain new passive perks. This page was last modified on 2 January 2019, at 00:00.